Offer Details: Groups of 10-20 are encouraged to make reservations, so an enhanced experience can be created with a dedicated Winery Ambassador. Please call 1-800-344-9463 to arrange your tasting appointment. A credit card will be needed to hold the reservation. For groups larger than 20, please see our Private Events section on our website to book your event. Hours: Open daily from 11 am – 6 pm. Closed on Thanksgiving, Christmas and New Year’s Day. Join us at 2 pm daily for a complimentary general tour of our winery. Tours meet in our Estate Tasting Room. Please plan for this experience to take 20-30 minutes. Please join us in our Estate Tasting Room to learn the unique story of our winery as you take in the sweeping views of the vineyard and valley. Enjoy food and wine pairings in a relaxing setting with cozy fireplaces, an expansive patio, spacious courtyard and a 65-foot lookout tower. 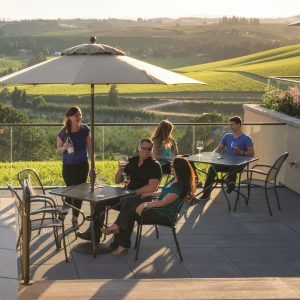 Enjoy a variety of classic Oregon wines including cool-climate varietals, such as Pinot Noir and Chardonnay, in addition to our small-lot bottlings. Our Daily Menu is served from 11 am – 6 pm each day, featuring fresh and local ingredients thoughtfully crafted by our Winery Chef to enjoy with our wines.